An Ancient Egyptian funeral and burial was designed to enable the deceased person to successfully enter the Afterlife and subsequently enjoy his or her time there. To ensure this they were buried with texts and objects that would help them on their journey after death. The Afterlife was believed to be an idealised version of the earthly realm - the Fields of Iaru, the land of the Blessed Dead, ruled over by Osiris. Just as in the living world, agricultural work would need to be done in order to provide food and drink. To prevent the deceased from having to undertake manual labour for the whole of eternity they were buried with servants, shabtis, who would do this work in their place. The name of these servant figures, shabti, is taken from the text carved on some shabtis (see below) and is also found in a variant form shawabty. In the Late Period they were also known as ushabti, which means "answerer" and is a reference to their function of answering the call for labour in place of the deceased. 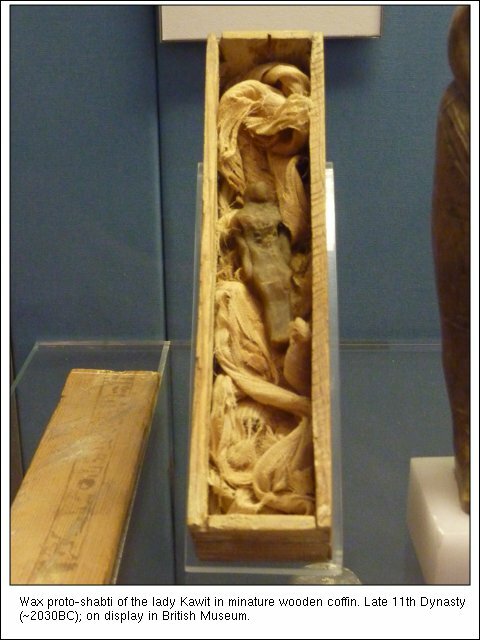 However the original word (shabti) may have referred to their form or to the wood that they were originally made from. Shabtis are figurines of varying sizes (from about 5cm to 65cm) and various materials (including faience, glass, pottery, various stones, wax, and various woods). They may be a carved likeness of the owner, or a more generic servant figure. Some carry labourer's tools or an overseer's whip, others are mummiform. The variance in form is determined not just by the time period the shabti was produced in (see below), but also the quality of workmanship that the deceased (or their family) could afford. Kings were buried with large & beautifully made shabtis, lesser individuals had smaller shabtis which may have been little more than wooden pegs. 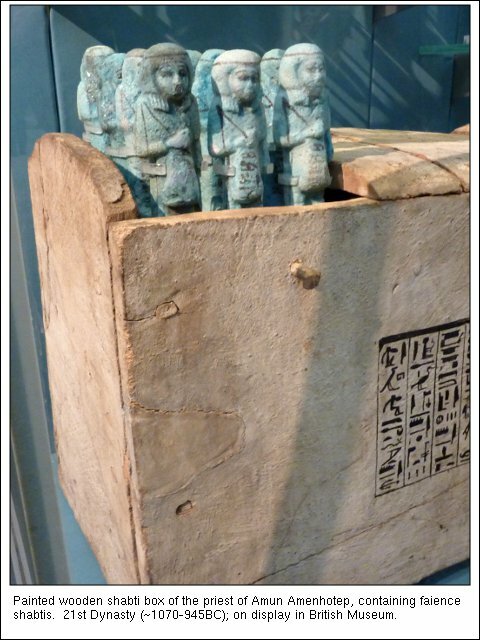 Shabtis were often buried in boxes, called shabti boxes, with their owner's possessions. O shabti, if [the deceased] is counted off to do any of the work which has to be done in the god's land - to make arable the fields, to irrigate the riparian lands, to transport by boat the sand of the East to the West - now indeed obstacles are implanted for him therewith as a man at his duty. 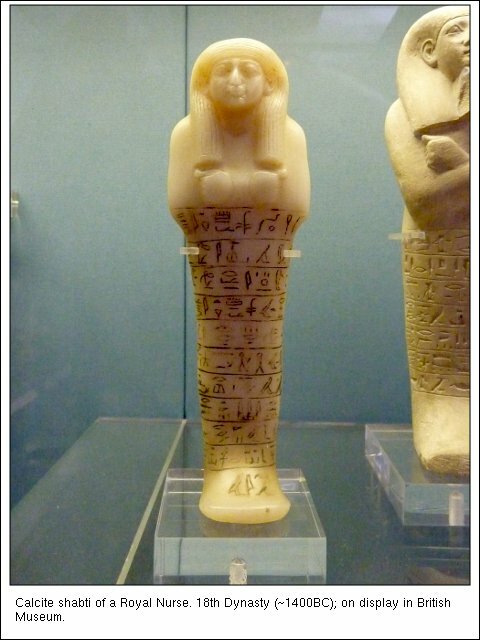 If one calls you at any time "Here I am" you shall say, "I shall do it"
Shabtis are first found in the Middle Kingdom where a single figurine would be buried with the deceased, perhaps in a coffin of its own. The earliest are small naked figures, and later they are generally mummiform and resemble the transfigured deceased - possibly acting as a substitute (should anything happen to the actual body of the deceased). 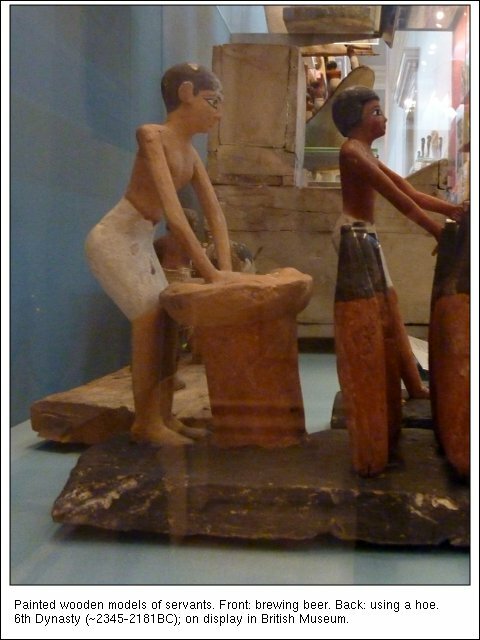 They also took on the role previously played by models of servants performing various tasks that are found in Old Kingdom tombs, and by the New Kingdom are frequently depicted with agricultural tools (or provided with model tools). During the New Kingdom, and into the Late Period, greater numbers of shabtis start to be found in each tomb, some of which are no longer mummiform but wore festive costume. Initially shabtis were only found in private tombs, but from Ahmose I in the 18th Dynasty onwards they were also found in royal burials. Later in the 18th Dynasty a typical private burial would still only contain a few shabtis but royal burials were provided with large numbers. The late 18th Dynasty Pharaoh Tutankhamun's tomb was found to contain 413 shabtis of which 365 were labourers, one for each day of the year. 36 were foremen, one for each 10-day week, and there were 12 overseers (one for each month). A few of these were donated by prominent officials in his court, to indicate their desire to carry on serving him even after his death. In the Late Period even private burials might have this many shabtis, and were sometimes accompanied by a receipt or certificate showing that they did belong to the deceased who had purchased them and thus they should work for him or her. The use of shabtis in burials died out in the Greek period. Note all pictures except first link through to a larger size. "The Illustrated Guide to the Egyptian Museum in Cairo" ed Alessandro Bongioanni & Maria Sole Croce. The American University in Cairo Press. 2001. "The Egyptian Book of the Dead: The Book of Going Forth By Day: The Complete Papyrus of Ani Featuring Integrated Text and Full-Color Images" ed Eva von Dassow. Chronicle Books 1998. "Tutankhamun and the Golden Age of the Pharaohs" Zahi Hawass. National Geographic 2005. "The Royal Tombs of Egypt" Zahi Hawass. Thames & Hudson 2006. "King Tutankhamun The Treasures of the Tomb" Zahi Hawass. Thames & Hudson 2007. "The Lost Tombs of Thebes Life in Paradise" Zahi Hawass. Thames & Hudson 2009. "Inside the Egyptian Museum with Zahi Hawass" Zahi Hawass. Heritage World Press 2009. "The British Museum Book of Ancient Egypt" Keeper and staff of the Department of Ancient Egypt and Sudan. The British Museum Press 2007. "The Complete Pyramids" Mark Lehner. Thames & Hudson 1997. "The Complete Tutankhamun" Nicholas Reeves. Thames and Hudson 1990. "The Complete Valley of the Kings" Nicholas Reeves and Richard H. Wilkinson. Thames and Hudson 1996. 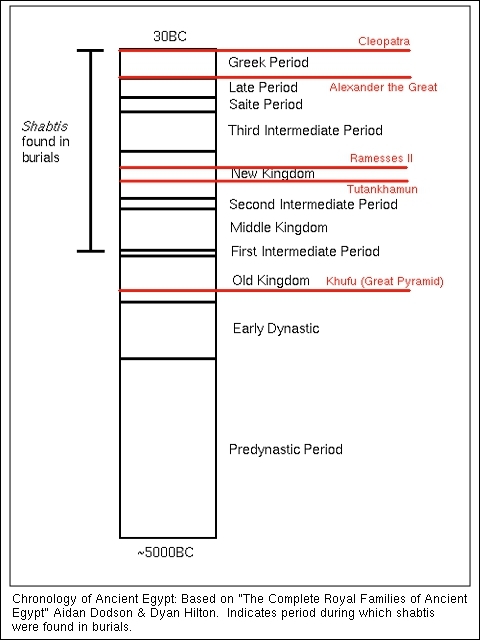 "The Oxford History of Ancient Egypt" Ian Shaw. Oxford University Press 2000. 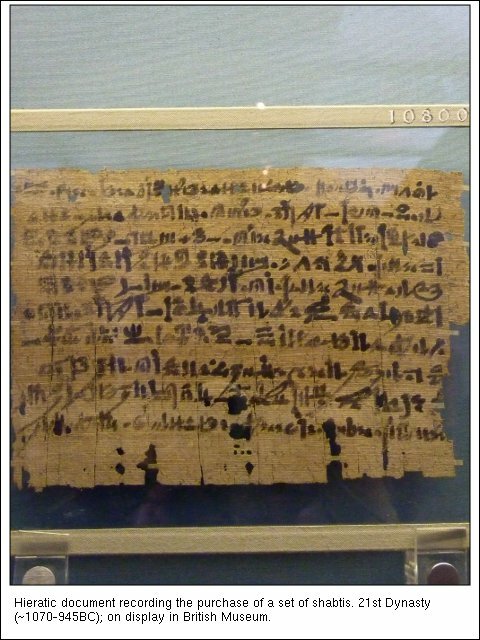 "The British Museum Dictionary of Ancient Egypt" Ian Shaw & Paul Nicholson. The British Museum Press 2008. "The British Museum Masterpieces of Ancient Egypt" Nigel Strudwick. The British Museum Press 2006. "The Cairo Museum Masterpieces of Egyptian Art" ed Francesco Tiradritti. Thames & Hudson 1998.
thank you very much. quite interesting.